So, how do I do it? Well, in the beginning it wasn’t easy. I soon found that with a growing family and gift giving list that if I waited until December to do all of my holiday shopping, I’d drive myself crazy(er). As a matter of survival, I made a mental shift. I decided that the best gifts I could give were full of thought and meaningful to the person I’m giving it to. And, for the sake of my bank account, I started shopping all year round either for items or ideas, which I have listed on my PDA and synchronized with my computer. Where do I get my kooky fabulous ideas? 1. Shop from wedding registries. Even after the wedding, stores keep these lists active for a period of time – use them they are the perfect wish lists. 2. Shop from baby registries. Even after the baby’s born, stores keep these lists active for a period of time too. 4. Think about their life’s circumstances and gift accordingly. Have they just moved? Then maybe a gift card to a to home improvement store/Container Store, etc. or gardening supplies may be appropriate or possibly a kitchen or household item upgrade. Started a new job? Try some new work clothes or a new computer bag. A college student? Try something computer related or dorm room living related likes a coffee maker. At a summer family reunion, one of my nephews kept asking his mom if he could use her digital camera to take a picture. I wrote this down on my gift giving idea list. It gave me time to look for an appropriate kid digital camera and in my niece and nephew price range (there are eight nieces and nephews on my gift list so I try to keep all of their gifts within the same price range) that had easy software that the kid can use on an older passed-down-to-the-kids-for-homework purposes computer. My nephew loved it because he wanted a camera but didn’t tell anyone. Thus, I secured my title as Most Fabulous Aunt on Plant Earth for yet another year. During a mini-break to New York with some friends, we noticed that all of the tourists seemed to be wearing Burberry scarves. It became a silly in-joke during the trip. That Christmas, Husband, and friends got Burberry scarves for Christmas. In addition, I totally earned my Frugal Hacker badge because I got a deal on them – I bought in August at a reduced price. Shopping early saved me time and money. Score. 7. Read the children’s letters to Santa. Before you mail them for your kids to the North Pole of course. 9. Try giving one big family gift. Such as event tickets, maybe a new TV or electronics, Netflix subscription if they are movie buffs, tickets to an event or show, zoo or water park membership, etc. I did this the December we bought the Condo and it was a big hit. Some of these gifts seemed a little extravagant but in reality when I divided the overall cost of the big gift by the number of family members the per person amount in some cases the was surprisingly less than what I normally budget per person. I saved money, time, had less stuff to wrap and less wrappings to later dispose of = all good things in my book. 10. Above all think and gift something that would be meaningful to the person you are giving the gift to and not yourself. I believe that holiday and birthday gifts should be given in the spirit of appreciation not as a punishment or reward or to change someone’s behavior or lifestyle to follow my personal philosophies. If you go that route, it leaves the door wide open for the recipient to turn around and give you gifts that try to force you to change your ways and subscribe to their religious, political or whatever philosophy they hold dear. That never works and the only thing it accomplishes is starting a huge argument during what should be a peaceful family get together. So Greenzillas, that means no compact florescent light bulbs as holiday gifts, unless you give them a lamp to go with it. K? Great tips! I strive to be that gift giver in my family but I have some work to do. I'm totally that aunt to my nieces also. Tip 1 and 2 are new to me. 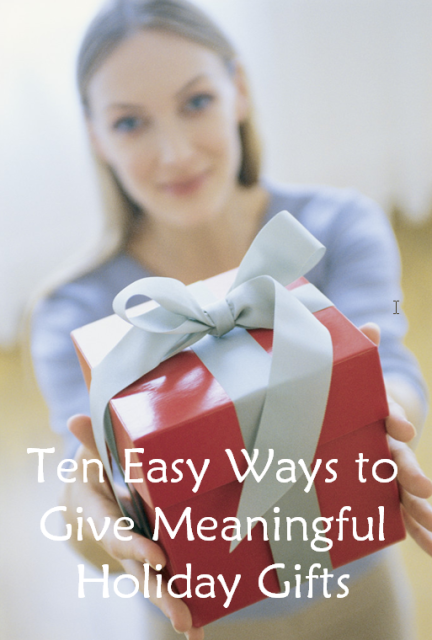 Good ideas!Tips 8 and 9 do make gift giving easier. Good list. I am putting together a family cookbook this year. Since I am a collector of craft items, I have had to spend very little money in putting it together.